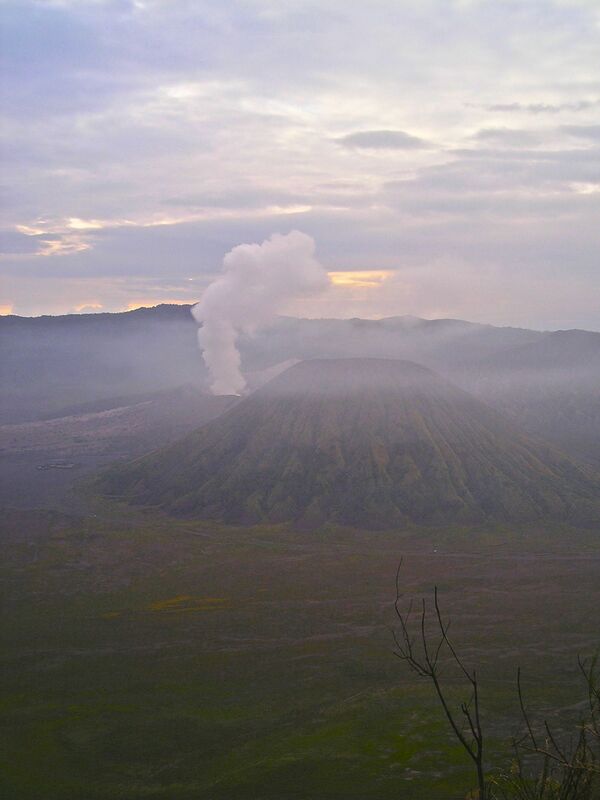 Favourite shots from my trip to Mt (Gunung) Bromo, East Java, 2010. 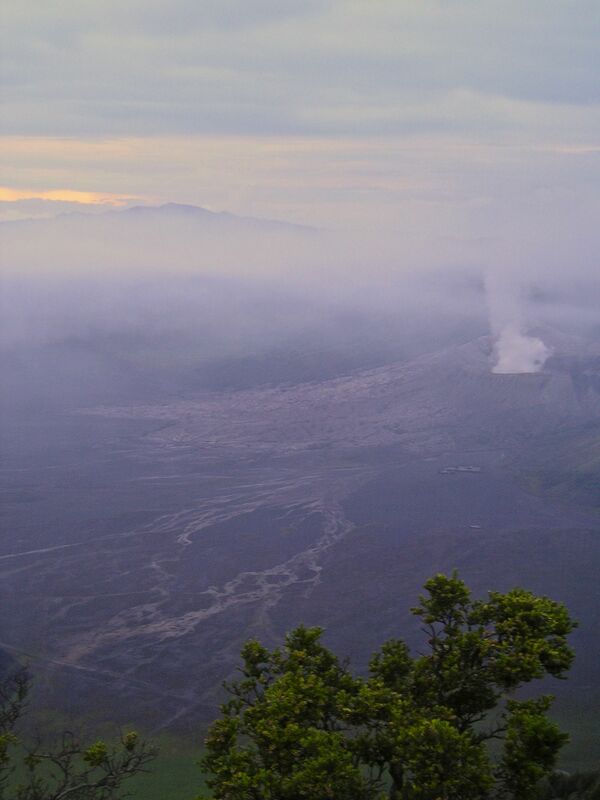 A gardening friend from Java mentioned he’d never visited Gunung Bromo. 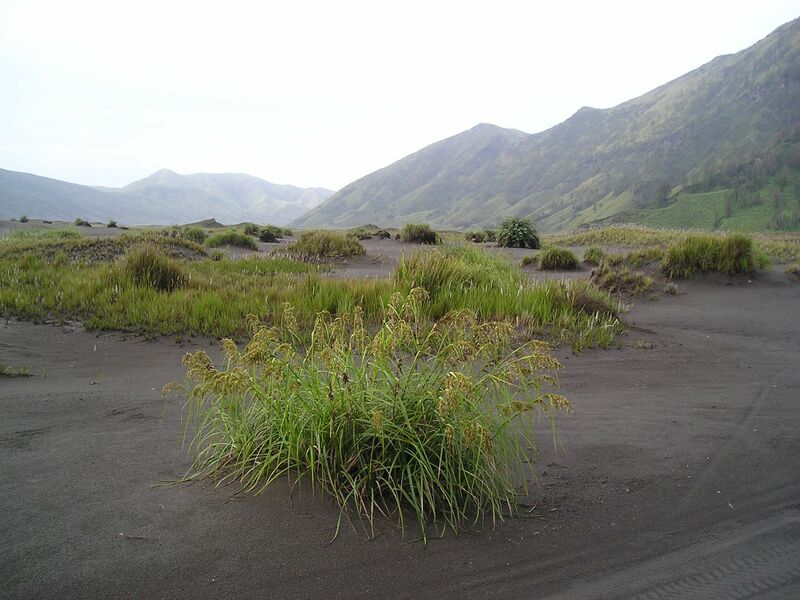 It’s in the Bromo-Tengger-Semeru National Park, one of the Indonesia‘s many natural wonders. 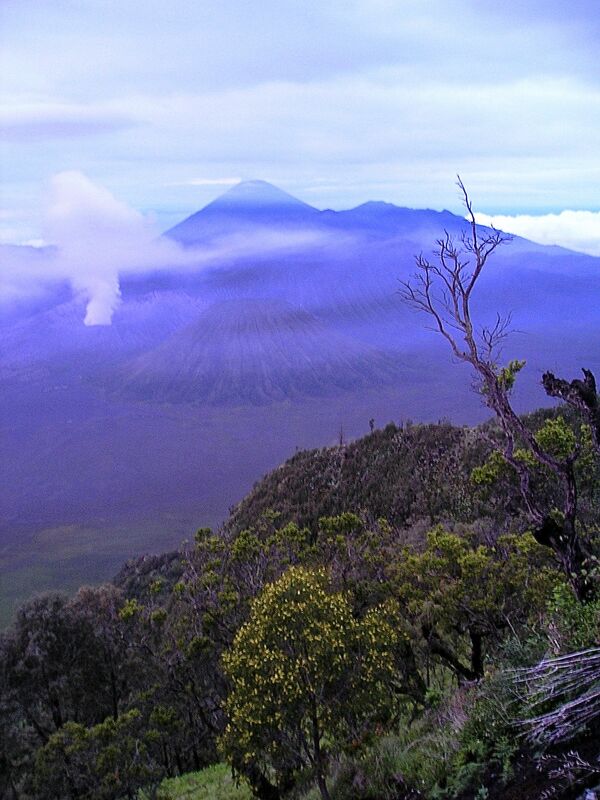 Gunung Bromo and Gunung Semeru are active volcanoes, unfortunately it was too dangerous to visit the latter, it was particularly moody. 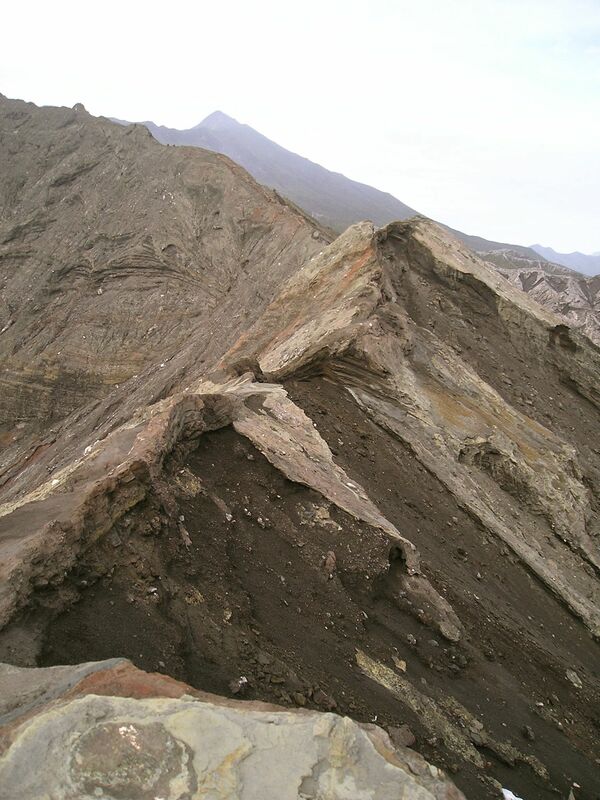 This shot is deep within the Tengger Massif, an enormous extinct volcanic crater. Gunung (Mt) Bromo is to the rear. Dawn illuminates a native sheoak, Casuarina junghuhniana. 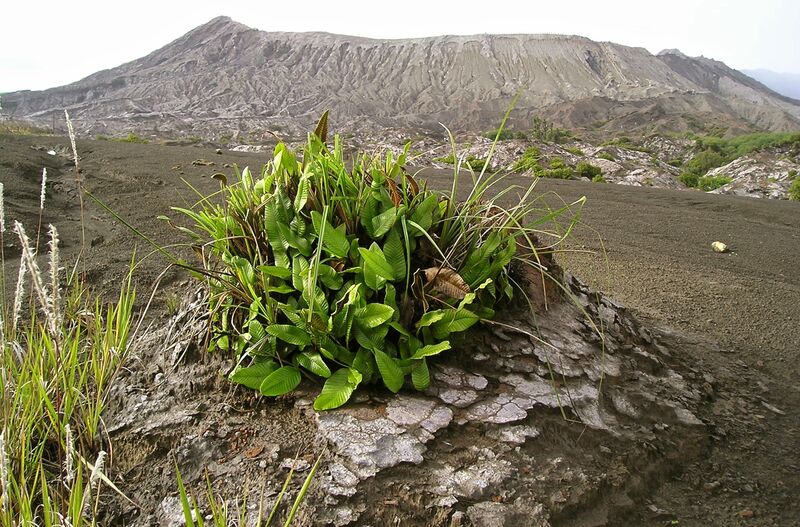 This is one of the first trees to re-colonise land after an eruption, forming ‘cemara’ woodland. 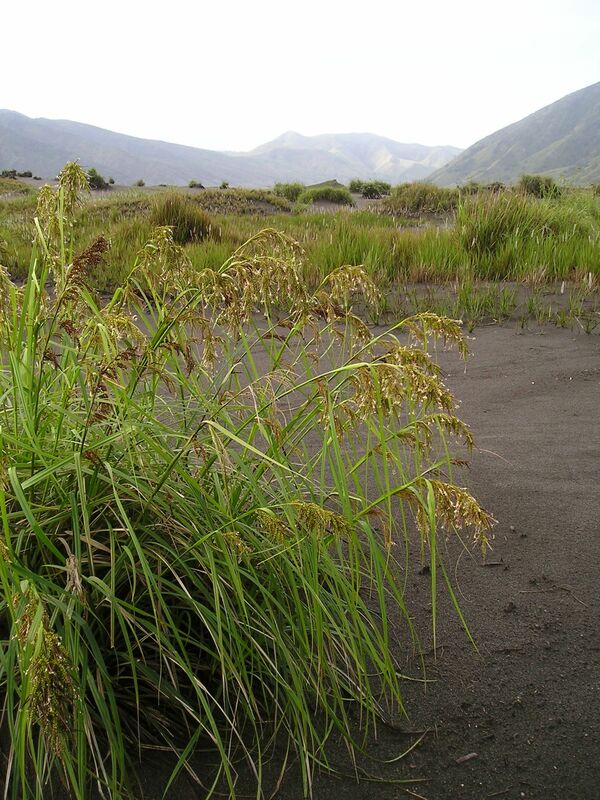 Flowering clump of sedge (Cyperus sp.) 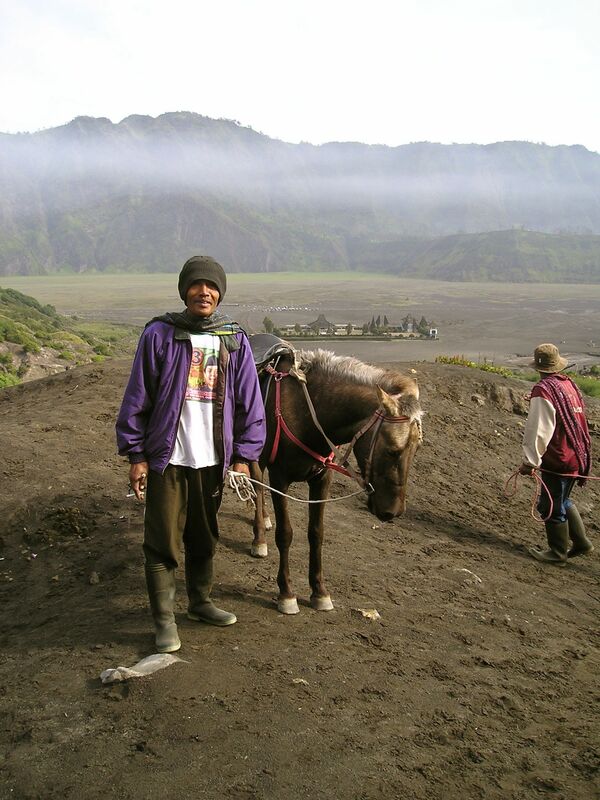 in the Tengger Crater. Pyrrosia, a photogenic species of fern that colonises trunks and rocks. The Sea of Sand, Tengger Crater, with Gunung (Mt) Bromo to rear. 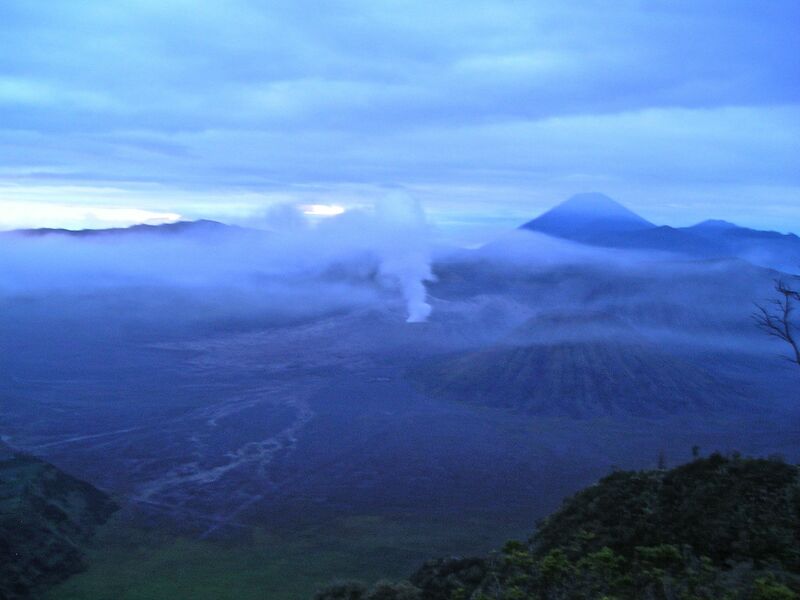 Dawn gradually breaks across the Tengger Semeru National Park. 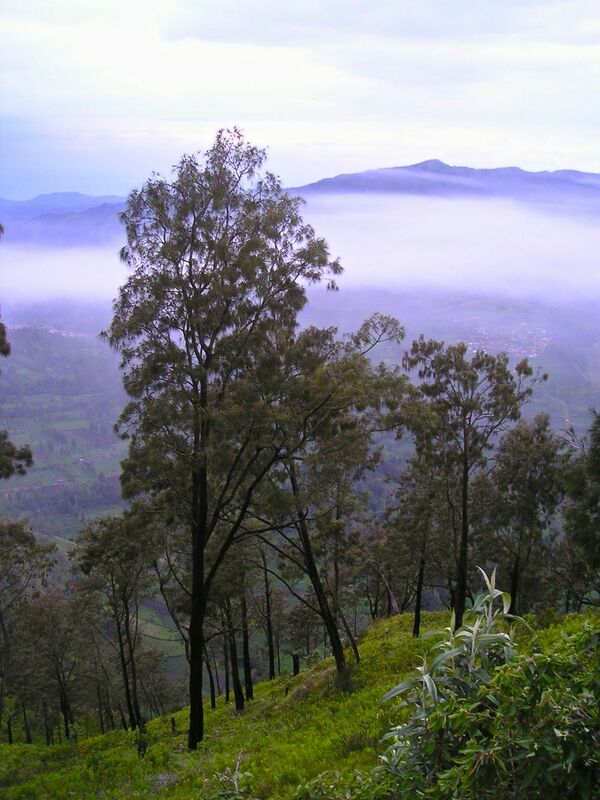 Viewing point, near Cemoro Lawang. Tengger Semeru National Park as the sun adds colour, and a little warmth. Tengger Semeru National Park as the sun adds colour. 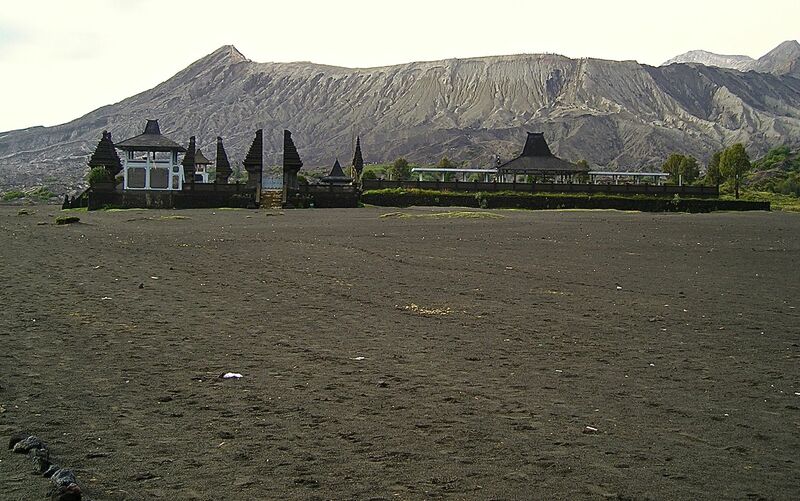 Poten temple, Tengger Crater. 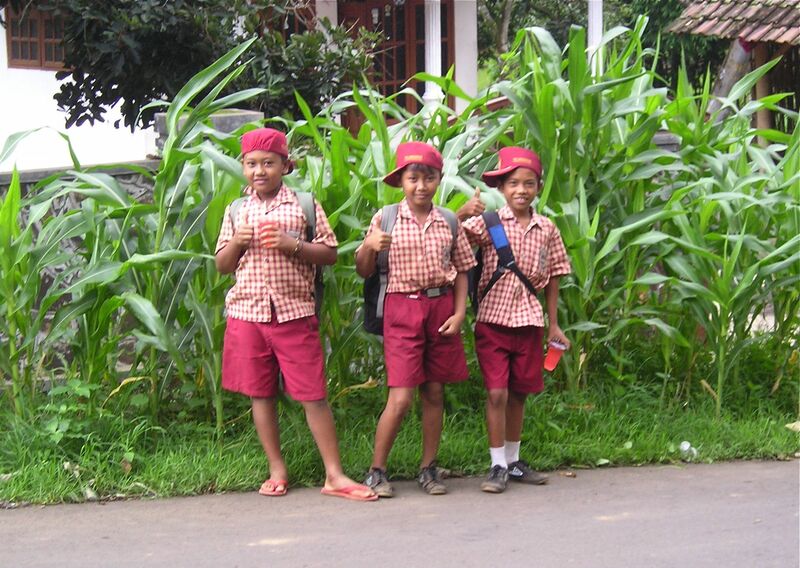 The Tenggerese are believed to be descendants of the Hindu Majapahit era, making them older than the Hindus of Bali. 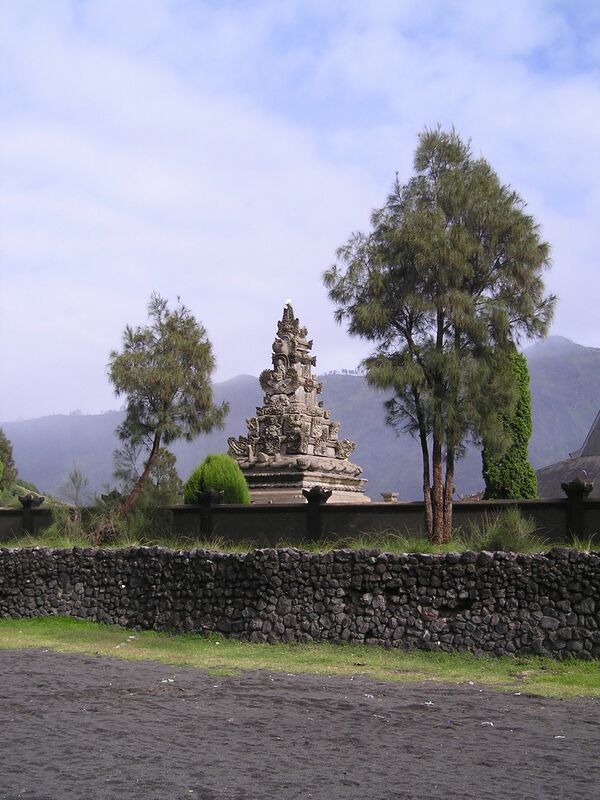 Built with faith: Poten temple, in the Sea of Sand, is just a stone’s throw from Gunung Bromo’s lava flows. 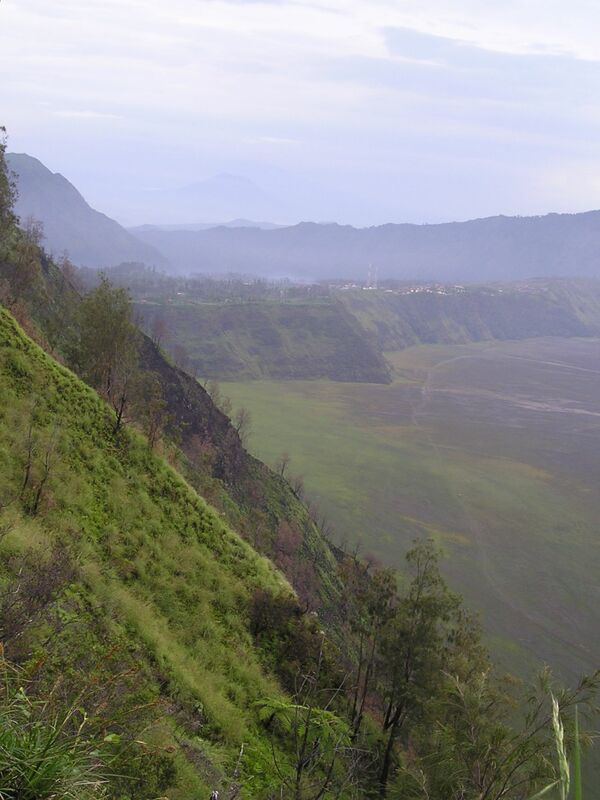 Tread carefully: Gunung Bromo has a soft, sandy crater rim capped with a crumbly, sulphurous crust. 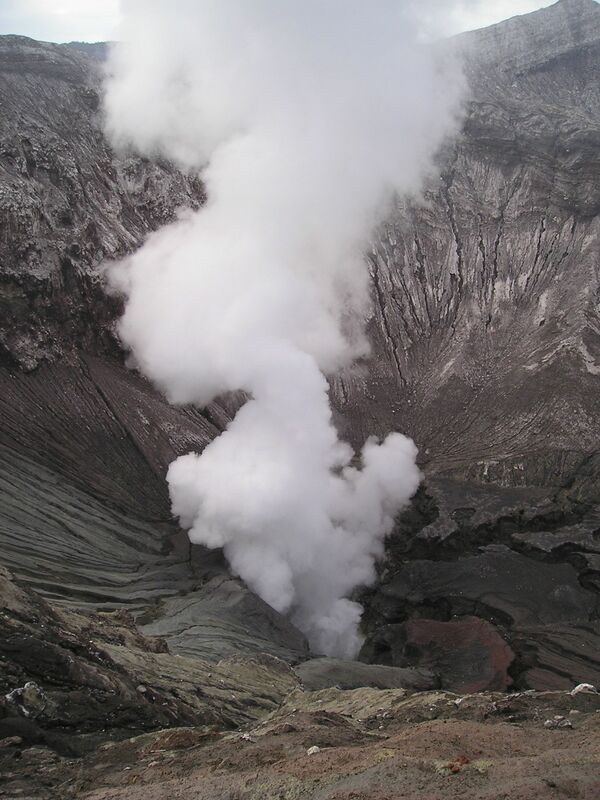 The rim plunges deeply into a steaming, conical crater. 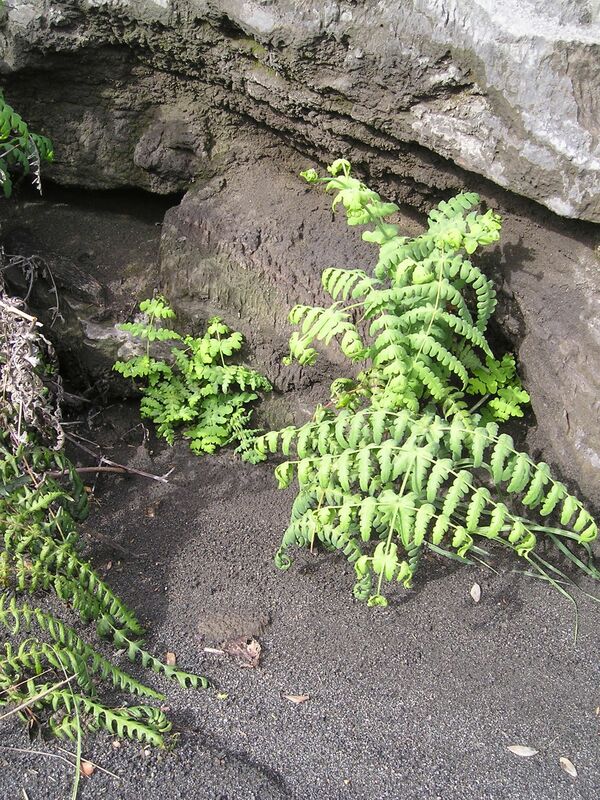 To colonise rocks, fern spores sprout in fissures. 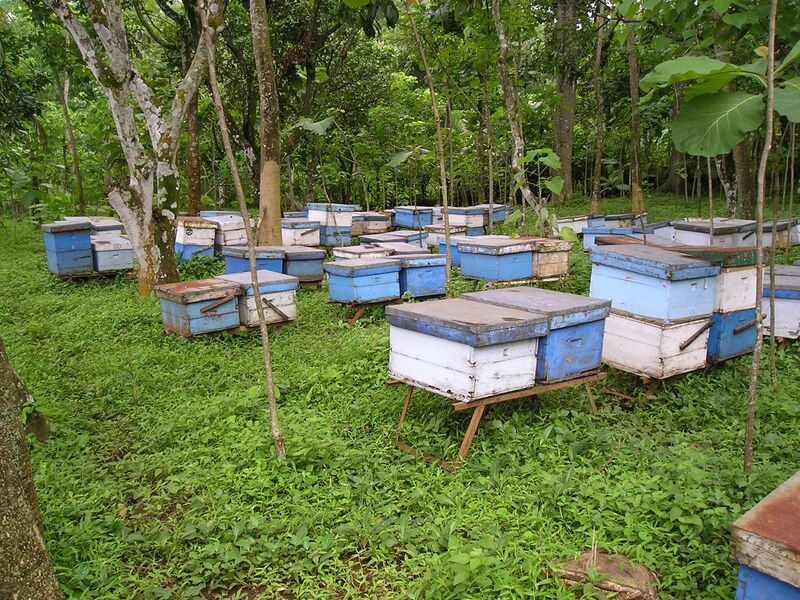 This species also grows in eastern Australia. 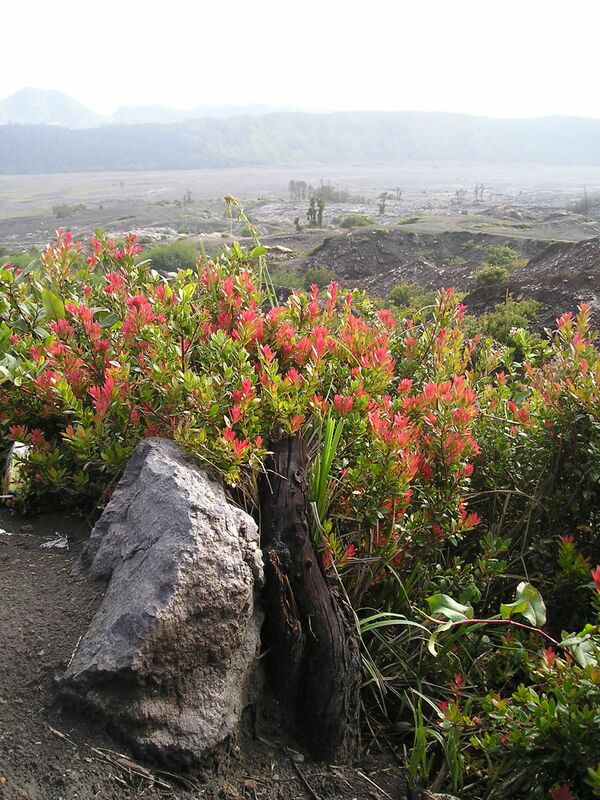 Vaccinium varingaefolium, a relative of the blueberry, thrives in the acidic, freely draining sandy soils on the moist flank of Gunung Bromo. 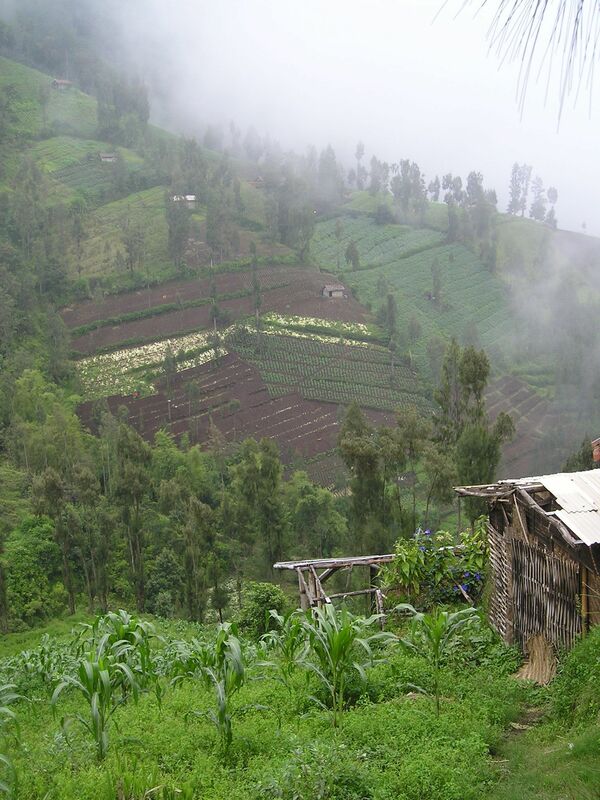 It’s cool and damp in the highlands at Cemoro Lawang. 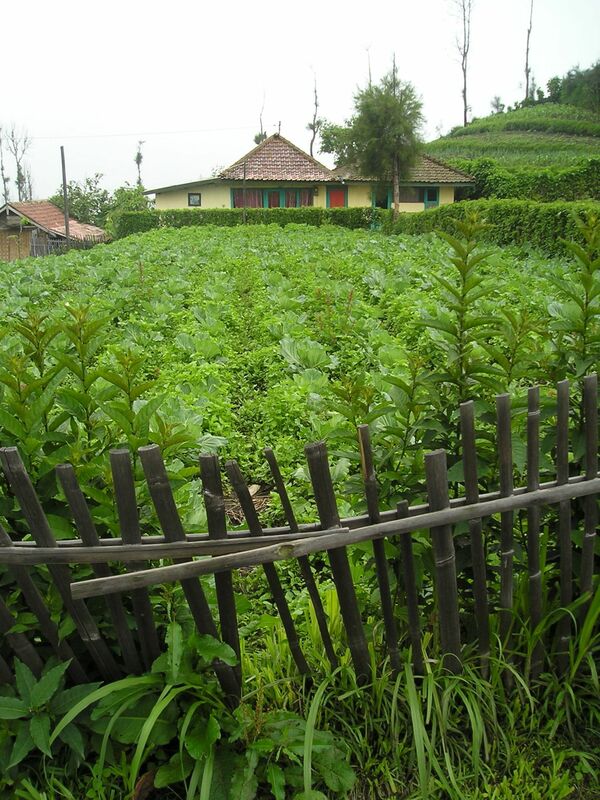 Here people grow cool climate crops, like cabbage and orach (aka mountain spinach, Atriplex hortensis). 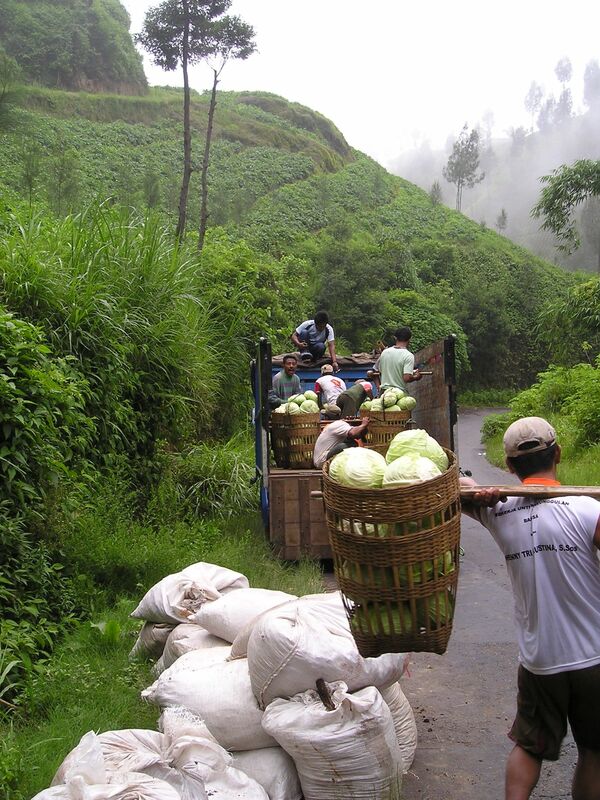 Cemoro Lawang: sending cabbages to market. 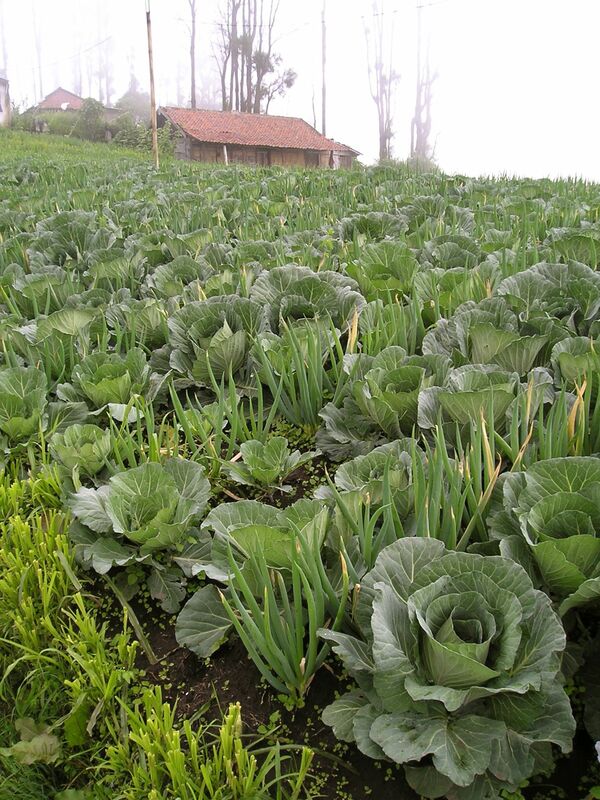 Cemoro Lawang: spring onions and cabbage. 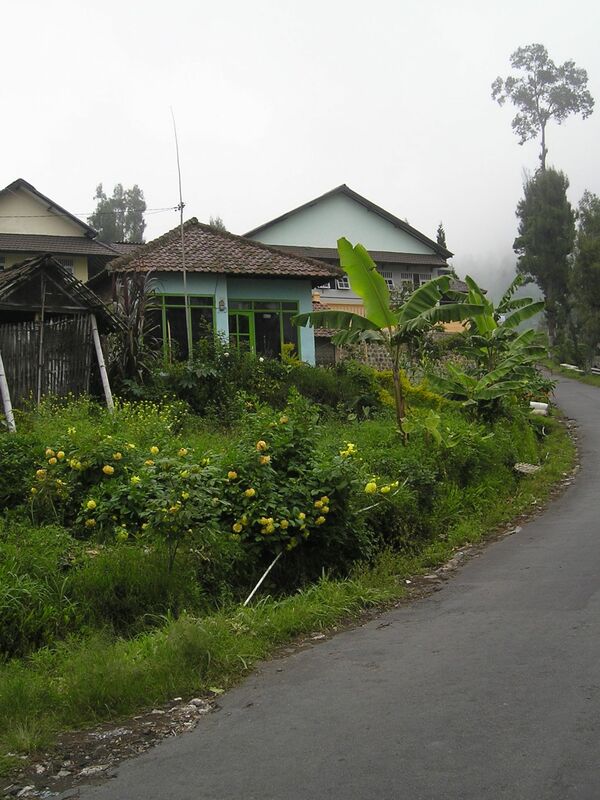 The main road that winds up to Cemoro Lawang and Gunung (Mt) Bromo. The view from Cemoro Lawang into the Tengger Crater. Mid-way up the road to Gunung (Mt) Bromo there’s a transition between lowland tropical crops, like pineapple and banana, and temperate crops of the highlands. 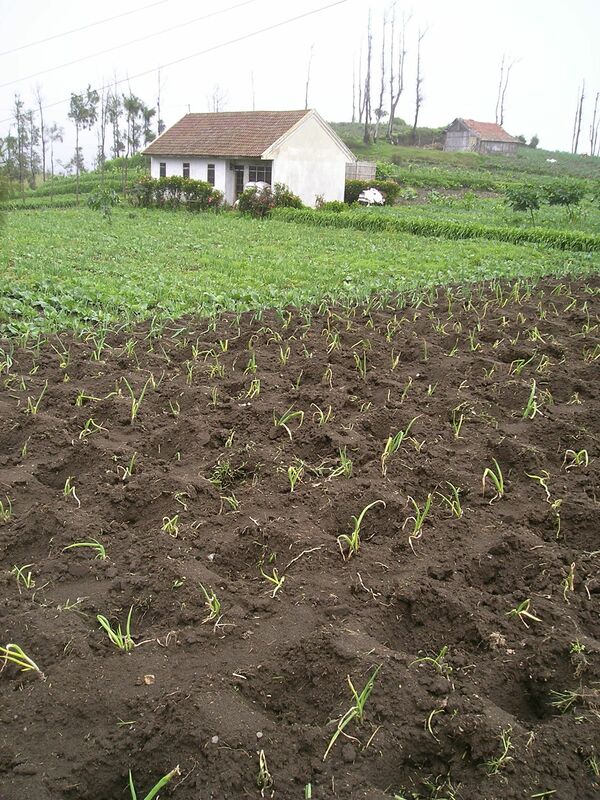 Gardening heaven: onions planted in pockets that gather rainfall. 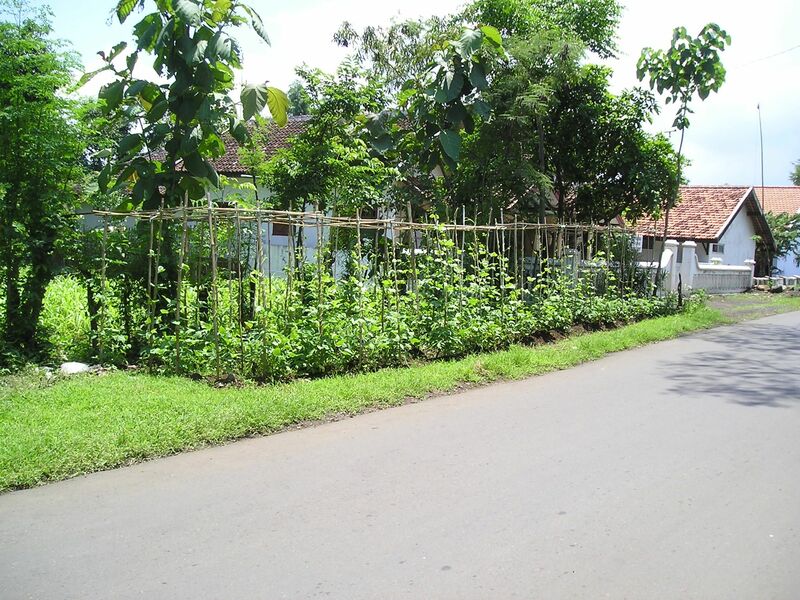 Javanese soil is volcanic, young and deep. 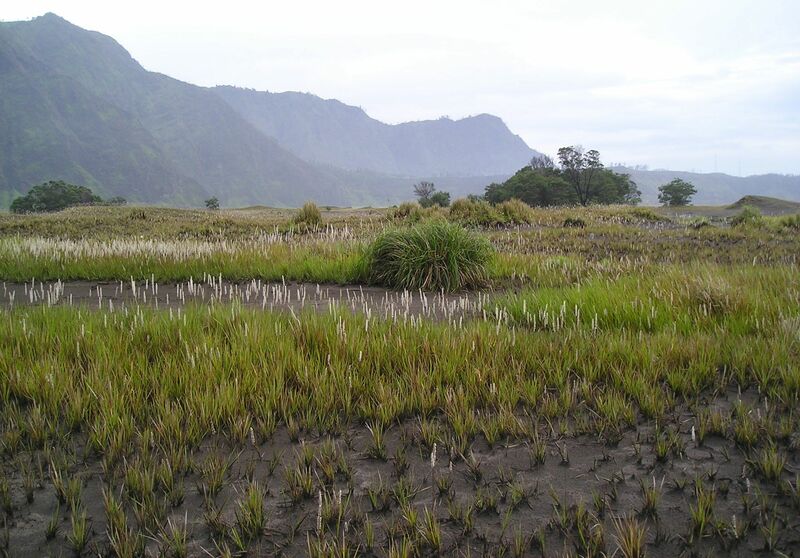 At Cemoro Lawang it’s indecently moist and fertile. 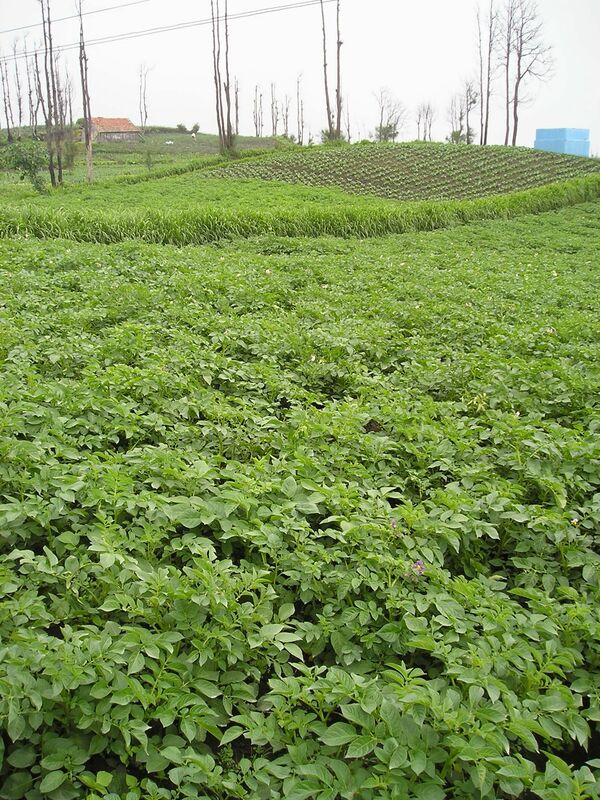 Javanese potatoes grow well in the highlands. 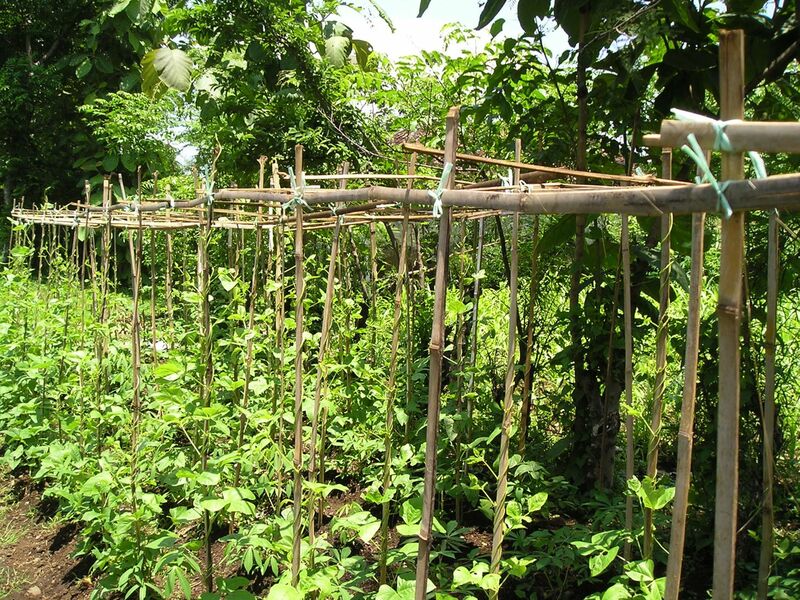 Certified disease-free seed potatoes are unheard of, consequently yields (and farm incomes) could be improved.